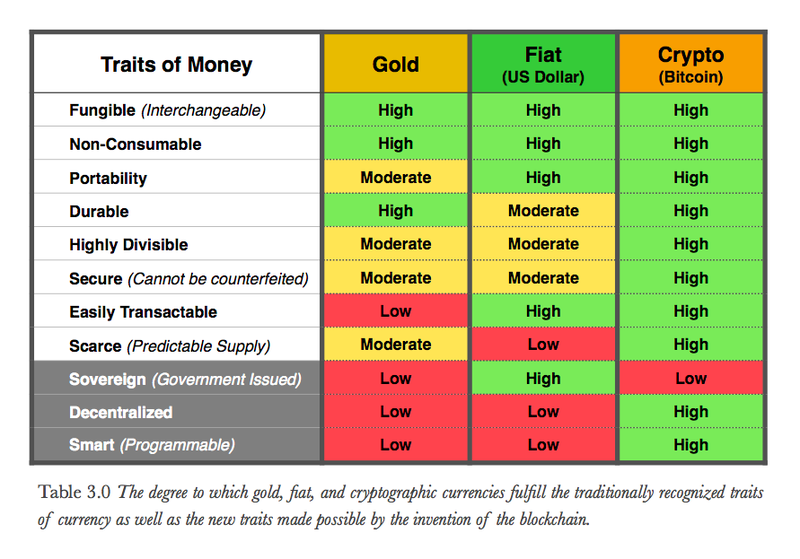 In May 2014 I published an article on CoinDesk discussing the traits of money in the context of Universal Darwinism. You can view it here. Imbedded within the piece was a chart I created displaying the traditional “traits of money” as recognized historically as well as some “new traits” now made possible by blockchain technology. It ended up making the rounds over the past 9 months making its way across twitter, reddit and even into Pantera Capitals most recent monthly bitcoin letter. I have been pleased to see its been well received and also stirred up some great debate and discussion. My only regret is that I have yet to give it the full and thorough explanation it well deserves to defend the traits I chose to include and my initial ratings of each. It is worth noting I recognize it has become a seemingly unpopular opinion nowadays to claim bitcoin is a good or better form of money. I’m finding more and more opponents, and even proponents, choosing to attack or deny this possibility. Proponents often boast bitcoin will find its niche as a payment platform or intermediary for exchange ignoring the “form of money” debate altogether — possibly in an effort to be taken more seriously in a professional world wrought with criticism (I can empathize with this and also acknowledge they may very well be right too). Opponents often have direct but wildly uninformed arguments often referencing 150 years of economic theory interwoven with biased opinion. It is my belief that irregardless of whether bitcoin or cryptocurrencies succeed or fail we need look no further than the inherent traits of money to determine which is best. For those interested in diving deeper into this subject… before you read on I only ask you take 10 seconds right now and do your best to detach yourself from your traditional understanding of money. As best you can, wipe the slate clean and think not of money as paper bills or metal coins but as a tool that requires specific traits to fulfill its purpose. You’ve been dropped off onto planet earth for the first time and you’re tasked with the job of creating the tool the world will use for money… no pressure. I spent a significant amount of time designing the table and pondering which traits to include as well as the degree (Low, Medium, High) to which each form of money fulfills each trait. As no such table yet existed I realized this may become a useful reference for many in the future so I didn’t want to drop the ball. It is important to understand why I chose to use the term “trait” instead of “characteristics”. In biology traits are heritable through the genotype (genes). They are the intrinsic elements that determine our makeup. Characteristics on the other hand are expressions of a genotype within a given environment — this is known as a phenotype. Stated more simply — characteristics are the result of traits. I make this point because I’ve seen many people claiming that bitcoin is inherently “too volatile” to be used as a form of money. Take only the most recent “Ponzi” whistle-blower Gary North’s article from Kernel. The mistake these individuals make is that they perceive price volatility to be a “genotype” of money (intrinsic) when it is in fact a “phenotype” (extrinsic). I’ve seen many individuals in the commentary of the article and on reddit make the same mistake. They propose that certain traits be added to the table when in fact they are referring to extrinsic characteristics. One such example is “Network Effect”. It is easy to recognize that network effect is not an intrinsic trait of any form of money — rather “network effect” it is the result of a money’s inherent traits thriving in a given environment. The first person to ever find gold didn’t pick it up and say “hey – this has incredible network effect!” — most likely they said, “wow – shiny!”. Over time golds scarcity, durability & fungibility were likely big contributors to its success and network effect. In Part 2 I will begin to break down my position on each trait and give context to what may appear to be a system of sweeping generalizations. Let’s be honest, a “Low, Medium, High” rating system is so I look forward to adding context.